Premature ventricular complexes (PVCs) are ectopic heartbeats caused by early myocardial depolarizations, previously thought to be benign. Recent studies found high PVC burden above 24% can induce or contribute to cardiomyopathy and heart failure. We present a case of PVC-induced dilated cardiomyopathy (DCM) from European Heart Journal - Case Reports, ytz016. A 68-year-old woman was admitted with pneumonia after an overseas trip with a preceding viral respiratory tract infection. An initial chest X-ray was suggestive of cardiomegaly. A transthoracic echocardiogram (TTE) revealed DCM with global systolic dysfunction (LVEF is less than 30%) without valvular lesions. Biochemistry and coronary angiography were normal. Clinical deterioration occurred despite medical therapy. A 24-h Holter monitoring detected 27% PVCs, which was thought to have caused DCM. 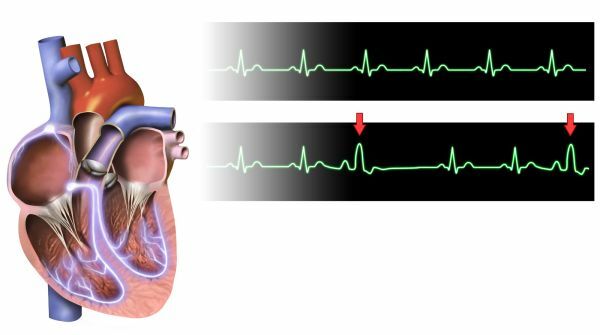 As an alternative to cardiac resynchronization therapy and an implantable cardiac defibrillator for primary prevention, ablation of the PVC focus led to complete suppression of ectopy. Post-procedure TTEs and Holter monitoring showed normalized systolic function and low PVC burden. Because high PVC burden can lead to cardiomyopathy and heart failure, suppression of PVC should be considered to restore ventricular function for patients with structural heart disease and frequent symptomatic PVCs. This case highlights that PVCs may be a modifiable risk factor for heart failure that can be successfully treated with pharmacological therapies or catheter ablation. In this case, high PVC burden from a single papillary muscle origin resulted in DCM, which was treated successfully with targeted ablation, resulting in improved long-term health outcomes 20 months post-procedure.